Restraint of Trade and Cascading Clauses: How It All Came Tumbling Down! The recent decision of Victoria’s Court of Appeal in Just Group Limited v Peck  VSCA 334 (20 December 2016) is a timely reminder to exercise care when drafting restraint of trade clauses. Even when “cascading” provisions are used, parties should not expect the court to do the work of making an agreement for them. With only eight weeks to go until the unfair terms in standard form small business contracts reforms take effect on 12 November 2016, and with the ACCC having indicated that the independent contracting sector is clearly in its sights, I am hoping that someone is looking at how this is going to play out for independent contractors and their principals in the recruitment, on-hire, and contracting industries. I might be about to ask more questions than I can answer; but let me ask them anyway and see if they bring a few issues into sharper focus. Defining the Undefinable. Pursuing the illusive definitions of “independent contracting” and “employment”. In the lead up to the 2016 federal election, the ALP committed “to work with workplace relations experts and practitioners, employers and unions to develop a definition of independent contracting that will provide certainty to workers and employers”. Despite losing the election, there are still plenty of people involved in state and industry politics, who would like to do much the same thing. So, let me explain why I think that heroic attempts to define independent contracting and employment are futile; and quite possibly counter productive, other than to reveal what the workplace relations experts already know – namely that the terms are neither defined nor definable. the contract is a standard form contract. We are exploring each of these key expressions as we prepare for the 12 November reform commencement date. So far, we have been looking at the definition of small business contract. A contract is a small business contract if it meets both a headcount requirement and an upfront price requirement. We have already considered the headcount requirement; let’s now examine the upfront price requirement. Waddles like a duck, quacks like a duck; but occasionally honks! Not everything that goes under the label, “labour hire” these days is labour hire. And that can be a problem – especially when an inability to nuance between different categories of employment services results in all being tarred with the same brush, or when terms of business misalign with the agreements for the supply of employment services that the parties have actually made. I’ve been intrigued by the conversation about the future of work and the way in which #Digital; #Mobile; #Social and #Just_About_Anything_Else_With_A_# have been #Disrupting the workplace. It’s been a hashtag fest. And that’s been a good thing. Although RCSA conferences over the past few years have been laying the groundwork, I was provoked most recently to think about this again after reading a couple of blog articles by Jeremy Scrivens. The first one that caught my attention was titled, Future of Work is The Restoration of Authentic Community at Scale; the second was The Future of Work is Business as a Community of Purpose and Belonging. These articles seemed to be making some important points about the How, the What, the Why and the Who of the future of work. Well, I retweeted them both, of course! And then I asked myself, why are we talking about this as though it’s always coming; but never quite here? Surely, if these disruptive influences can already be identified in some work settings, this Future of Work, this re-scripting of the fundamental narrative about Work and the Firm is already happening. So, what are we going to do about it? Because at some point we have to do something – beyond preparing (or borrowing from) another prophetic keynote speech! At some point, we need to assess what is happening – not just to the workplace; but to the foundations of what believe, or think we believe, about Work and the Firm. And then we need to adjust for it in ways that help to realize and release this positive and productive force that is the #FutureofWork. This agreement contains everything that we have agreed; and we have not agreed anything that is not in this agreement; and we will not agree anything that is not in this agreement unless we agree it in writing and put it in this agreement. Authentic community? Community of purpose and belonging? It seems that we have accepted the proprietorization (Spellcheck tells me that is not a word, so I had better make it #Proprietorization) of work relationships; and, in the process, we have lost sight of the connection of work to community – at least to the extent that the authenticity of our work relationships is now strained and overdue for re-evaluation. And that re-evaluation is what I am having to do right now as I set to work on designing new ways to charter more open and permeable work relationships. It is a challenging and confronting exercise. I am having to find fresh language to script new narratives of work and of the firm. I am needing to think not so much in terms of ownership (possession, exclusion; fencing out) as in terms of stewardship (care, inclusion, fencing in). I am needing to think not so much in terms of obligation as in terms of co-operation. And I am having to find ways to charter co-operative relationships that are sufficiently elastic to accommodate disruption and change and yet firm enough to support productive engagements. Others of you, who work on contracts, are no doubt similarly engaged. It will take all our skill – and perhaps skills that we do not yet have – to get it right. And that is exciting. OK, so perhaps, “Spring is the mischief in me” after all; and I could say, “Elves”. But it’s not elves exactly and I’d rather you said it for yourselves… with or without the #hashtag! “I’m a PAYG Contractor” (Australia) – You’re a what? A lot of questions start, “So, if a PAYG Contractor…” and then run on as though everybody was quite certain of what that was. Contractor is a generic term, the boundaries of which are imprecise. It frequently refers to a person who performs work on contract, rather than in ongoing service or by ongoing office. In the case of a contractor, the contract and the work are largely coterminous – i.e. their boundaries are closely aligned. Contractors may be dependent (a colourful description) or independent (a legal term of art). They may also be employees. Not every contractor is an independent contractor. Independent describes the status or autonomy of the contractor. PAYG describes only the Australian tax system that is applied to the contractor. PAYG Contractor is therefore not a precisely defined or distinct species of worker, though employment services industry participants often use the expression as though it were – and build business models around that misconception. If you have a question that starts off, “So, if a PAYG Contractor…” try to work out what the work relationship really is. In most cases once you have done that, the answer will come to you pretty quickly – though you might not always like it! What! But don’t you teach it? It is true that there are lots of laws that impact upon the employment relationship; but the relationship is dynamic and subject to a vast array of laws that are forever coming, going and changing. Indeed, it is difficult to conceive of any area of law that does not impact, in some way, upon the employment relationship. 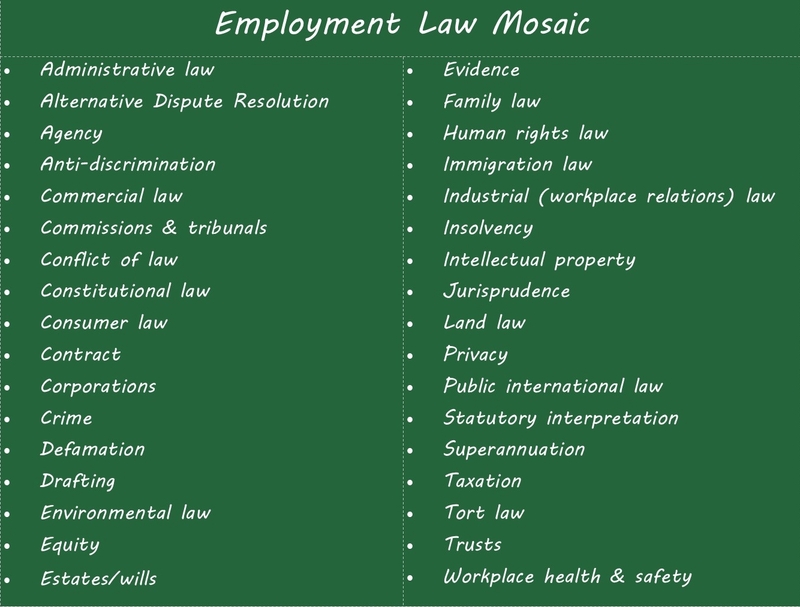 Usually when we commence an employment law unit, we start by looking at the thing we call the “Employment Law Mosaic”. It is simply a list of different areas of law that we think impact upon the employment relationship in some way and with which, as practitioners, we need (try) to be familiar. How many areas of law listed on the blackboard do you think relate to the employment relationship? Are there any that don’t? Can you think of any others? Can we set off the over-payments? Audience: (Pugnaciously) But our contracts say we can! Me: Yeah, they do. Funny that. Probably not! Me: Because you can’t usually raise a contractual set off against a statutory entitlement.